Hi we just found a single bug which looks more similar to a male bed bug on our pillow yesterday evening.. hence we have a doubt whether there will be bed bug infestation in our home. Is there any possibility for it? We have not experienced any bites and when we checked our mattress and we didn't find any.. so should we concerned or be cool? Please help with our doubt.. we are concerned as we have two small kids. Most people show no skin reaction when bitten by a bed bug, so the lack of any rash or bites does not mean that you haven't been bitten. The best thing to do if you can is to get a professional to look at the insect and determine if it is a bed bug. 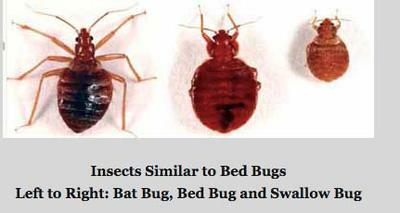 Bed bugs look like other insects (see bed bug identification tips. See if your local University has a staff entomologist that can examine your specimen.